Congratulations! You win 105 bonus points with this purchase! The lenses are comfortable to wear but it seems that 50% of them are packed inside out. It is a rare occasion that I take lenses out, insert them and find that both are fitted correctly. This is not the fault of Lentiamo, of course. Sometimes the lenses are stored upside down and they have to be removed from the eye and re-inserted. This sometimes causes them to stick to themselves and can be damaged when pulling them apart. Very good quality. Have been using for many years. Product goodnDelivery poor - stacked two lens boxes, each which fit through a letterbox, on top of each other so that they no longer fit through a letterbox. Had to get redelivered to my local post office, because of course I can't be in to collect a parcel when I work full-time - part of the reason people shop online in the first place! Cost me extra time and money. I want hassle-free online websites so I won't be using them again. I've used these since I was 18. For some reason I cannot tolerate the silicon lenses, so am very happy these are still around. As the product suggests, lenses are used daily and are super comfortable. They are in my eyes from 540am until 1100pm with no problems whatsoever. I have been a contact lens wearer for 35 years and these are by far the best. Very good lenses - have been wearing them for some time now ad they are very comfortable indeed. These are for my daughter,she is at college and uses them daily. good and comfortable but slightly too thin lenses, make them harder to handle. I've always used these lenses, very comfortable even though they are a little more expensive. I don't find the moist is any better than the plain acuvue but I have dry eyes. These lenses suit me very well and have come back to them after trying other types.nConvenient to use. I have used this brand for a few years now and have now found a place where I can buy them at a good price with quick delivery. I put them in most days. They work. I can see better with them in, than without. Always a bonus. I wear daily lenses to play tennis and find them easy and practical. 1-Day Acuvue Moist are daily disposable contact lenses from Johnson & Johnson. Made with LACREON moisture lock technology that provides amazing comfort and freshness all day long, these lenses are easy and comfortable to wear. These lenses are great if you find that you are suffering from redness or dryness of your eyes. These lenses will help keep your eyes moisture in and irritation out! Unfortunately this product only has those two choices for base curve. Please ask the Ophtamologist about a suitable brand. Thank you so much for your comment. The difference between these two brands is the material. Acuvue Moist has Etafilcon A while Trueye has Narafilcon A, this means that one material can suit you better than the other. That is exactly the difference between all the lenses and brands, the material. That is why you have to check with your optician what material suits you and it is not uncomfortable for you. Once you know what lenses are the best for you, you can buy them with us. Customer care service of Lentiamo. Hello, I'm after -5.25 in the right eye but I can't see it listed, but you do stock -6.50 for my left eye. Will you be getting more stock in please? Hello, Unfortunately 1 Day Acuvue Moist 90 lenses are not in the power –5.25. At this moment we do not know when they will be available. We can offer you 1 Day Acuvue Moist 3×30 lenses in your power . I cannot find these lenses in -2.00, do you stock them in this prescription? Unfortunately 1 Day Acuvue Moist 90 lenses are not in the power –2.00. At this moment we do not know when they will be available. We can offer you 1 Day Acuvue Moist 3×30 lenses in your power . At the 90 lenses price ? Yes, this is price for 90 lenses. Hello, Thank you for your query. The 1 Day Acuvue Moist only come in Base curve 8.5 and 9, Diameter 14.20. In the required parameters, we offer PureVision which are monthly lenses, Acuvue Advance Plus and Acuvue 2 which are both two-weekly. An eye care professional will advice you on the right choice of contact lenses. A selection of a contact lens is such an individual matter that it requires a visit of an eye care expert and the right prescription. Hi, Do you stock these in Base Curve 8.3, Diameter 14, Power -2? I am looking at purchasing contact lenses for my daughter. 1/ do you send to Jersey in the Channel Islands, 2/ I need 1 day Acuvue Moist with Lacreon, the box also says UV blocking, are these ones the same lenses? Thank you for your query. We dispatch to Jersey. 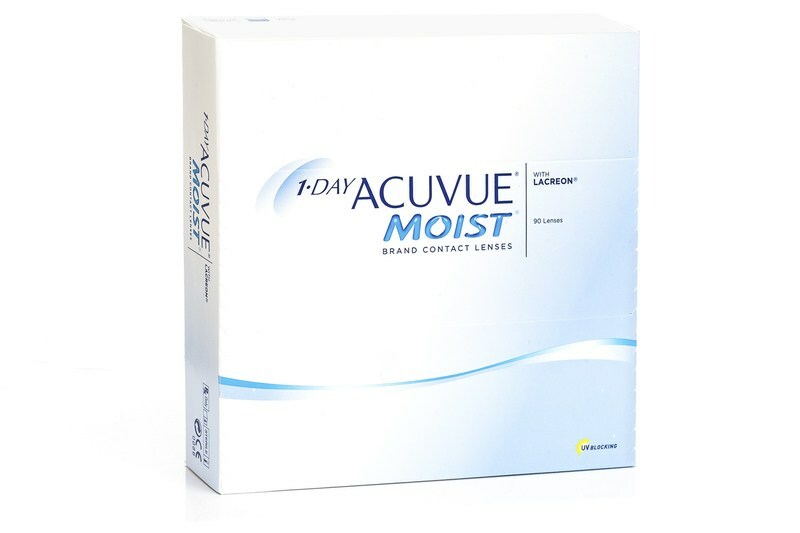 1 Day Acuvue Moist as they appear on our website are the lenses you are looking for. They contain UV blocking and Lacreon. Let me know if you need anything else. I am here to help. What's the shipping rate to Gibraltar? Thanks! Thank you for your query. Due to the customs regulations, we do not dispatch to Gibraltar at the moment.